fuels thereby having a neutral effect on CO² exchanges. This makes a significant positive contribution to the preservation of our environment! The concept of the Adam-Retort works in 2 stages. In the first phase the wood in the retort chamber is dried by hot flue gases and the carbonization process is initiated. 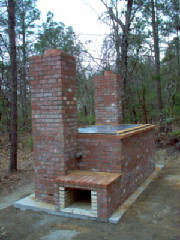 The hot flue gases are produced with waste wood pieces in an external fire chamber. By waste wood we mean small branches, twigs, pine cones and other residual products. About 100 lbs of waste wood is burned per batch. As soon as the water in the wood has evaporated, the vapor produced is sufficiently hot enough and the first inflammable wood gases appear, the smoke is now rerouted and burned off in the hot fire chamber, reducing pollution. This additional energy is used to heat up the wood chamber and to further accelerate carbonization during this second stage. Between 1300 - 2000 Lbs of wood (dry weight) can be loaded, from which 450-750 Lbs of charcoal can be created. Helps the soil retain nutrients (like nitrogen, calcium, phosphorus), compost, and beneficial microorganisms much more effectively than unimproved soil. Helps your plants utilize and absorb more nutrients from the garden soil, particularly when used in conjunction with compost or well-rotted manure (thus packing your vegetables with a higher nutrient content). Reduces the need for irrigation.